Cobalamin is a unique metal complex coenzyme that contains the cobalt ion sitting in the centre of a planar tetrapyrrole ring (corrin ring). It is unique that its de novo synthesis appears to be restricted solely to some bacteria and archaea, and the biosynthesis of cobalamin represents the most complex biosynthetic pathways known in nature. Despite the fact that only a subset of prokaryotes is capable of synthesizing cobalamin, which is required by humans and other organisms for diverse metabolic processes. This active metal coenzyme plays an essential role as electron transfer mediator in reductive dechlorination of chlorinated organics. Therefore, the application of such biomimetic chemical in engineered treatment systems for remediation of water and soil contaminated with halogenated compounds has shown excellent significance. This review aims to provide a systematic introduction of cobalamin. Firstly, the biosynthesis of cobalamin is briefly described, and the strategies and tools that have been applied to increase microbial cobalamin production are reviewed. Then, the catalysis effect of cobalamin on reductive dehalogenation and the main decisive factors are discussed in detail. Also, the fundamental dehalogenation mechanisms are introduced. 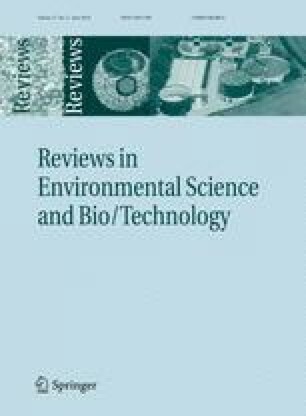 Finally, the key questions that need to be resolved in the future are point out, which include the field measurements, the mechanistic pathways of the reactions in the presence of more than one pollutants, the design and implementation of a technology that speeds up the cleavage of Co–C bond in reductant systems to guarantee the rapid regeneration of the reactive cobalamin species, and the lab-scale application of immobilized cobalamin rather than insoluble cobalamin. This work was financially supported by the National Science Foundation of China (51425802), and the Program of Shanghai Subject Chief Scientist (15XD1503400).